"This Secrets of the Dead special paints a portrait of a missing link in the evolution of humans using forensic techniques. After 13 bones were found in a volcanic layer dating back at least 6 million years in Kenya in December 2000, scientists nicknamed this earliest hominid the 'Millennium Man.' Scientists believe that further study of these bones will rewrite the story of human evolution." "For decades paleontologists have been searching for vital clues in Africa -- the remains of creatures nearest to the event that changed the world, the split between man and ape." "In November 2000, Martin Pickford and Brigitte Senut from the College de France and a team from the Community Museums of Kenya make a remarkable discovery. In the Tugen Hills of Kenya they unearthed a group of fossils they believe sheds light on the origins of humankind. The team called their find Orrorin Tugenensis. It seemed like the discovery of a lifetime. Or was it?" "The bones are older than any hominid bones found before. They are a staggering six million years old." "Today, Orrorin is unleashing one of the greatest controversies the study of human origins has ever seen. But is it really a hominid?" "The defining feature of the human race is the ability to walk upright. So this is what paleoanthropologists look for. They search for fossilized clues that can tell them whether the creature spent most of the time walking on two legs rather than four." "If Martin and Brigitte find these clues and Orrorin was, indeed, walking on two legs six million years ago, scientists will have to rethink their ideas about how we split from the apes. The standard theories on how, when, and why we learned to walk on two legs would have to be reexamined." "Martin and Brigitte also make a claim about one of the most famous discoveries of all time: "Lucy," a hominid from just over 3 million years ago in Ethiopia. Donald Johanson, who discovered her in 1974, claimed her to be our direct ancestor." "The fossils from Orrorin have led Martin and Brigitte to the revolutionary conclusion that Lucy and her type, the australopithicines, were not our direct ancestors: rather, they were a branch that became extinct." 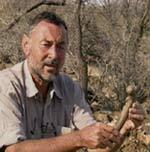 Orrorin was a local Tugen mythological figure, "The Original Man"
Martin Pickford and Brigitte Senut challenge the traditional explanation of bipedalism, "The Savannah Hypothesis"
if bipedalism arose before the appearance of the savanna, how did it arise? "sometimes split, sometimes died off"
". . . 96 miles down the line, and 3.2 million years into prehistory, we eventually find -- Lucy." "this is from the Lake Miocene in age so it has to be around 6 million years ago"
"Orrorin was almost certainly a social beast"